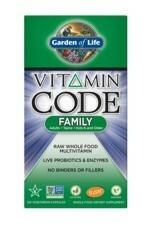 Made with individually “grown” nutrients utilising probiotic cultivation to produce RAW Food-Created Nutrients™, Vitamin Code supplements are delivered in a whole food base of fruits and vegetables. 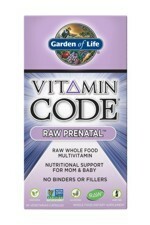 Vitamin Code supplements are RAW, which not only means that they are produced below 115º F, but also means that these nutrients come with their natural cofactors, along with live probiotics and enzymes, just like raw foods! 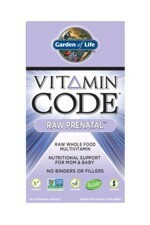 Vitamin Code raw powders are delivered in capsules without any binders or fillers—everything you want and nothing you don’t want. 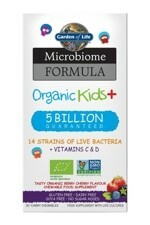 Vitamin Code Kids Multivitamin 60 Chewable Bears by Garden of Life is a great-tasting chewable whole food, Non-GMO Project Verified multivitamin to help support your child’s normal, healthy immune system. Made with Vitamin Code vitamins and minerals in a base of 24 family-farmed fruits and vegetables, Vitamin Code Kids helps support your child’s metabolism and energy production as well as the maintenance of bones. Clean whole food ingredients are gently blended, never heated, into a base of fruits and vegetables—and there are no artificial flavours, sweeteners or additives. 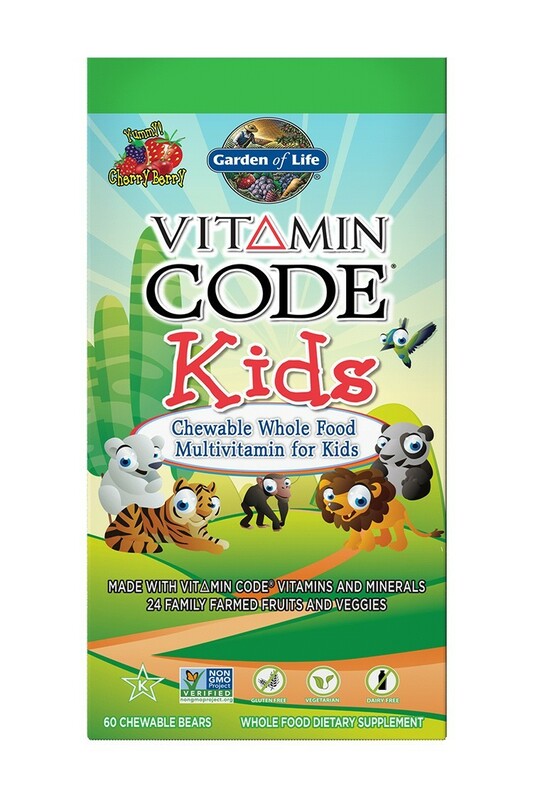 Vitamin Code Kids—Non-GMO Project Verified chewable whole food multivitamin for kids blended in a base of 24 fruits and vegetables from family farms—plus live probiotics to help support healthy digestion. 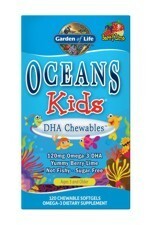 Children 4 years and older chew 2 bears daily under adult supervision. Each pot contains 60 chewable bears. Serving size 2 bears. Vitamin A (as beta-carotene) 900 µg RE (113% RDA); Vitamin C 60 mg (75% RDA); Vitamin D (as D3) 10 µg (200% RDA); Vitamin E 10.72 mg α-TE (89% RDA); Vitamin K 50 µg (67% RDA); Thiamin (Vitamin B1) 2 mg (182% RDA); Riboflavin (Vitamin B2) 2 mg (143% RDA); Niacin (as Niacinamide) 20 mg NE (125% RDA); Vitamin B6 6 mg (429% RDA); Folate 200 µg (100% RDA); Vitamin B12 6 µg (240% RDA); Biotin 200 µg (400% RDA); Pantothenic Acid 5 mg (83% RDA); Calcium 20 mg (3% RDA); Iodine 100 µg (67% RDA); Magnesium 10 mg (3% RDA); Zinc 1 mg (10% RDA); Selenium 30 µg (55% RDA). RAW Organic Fruit and Vegetable Blend (170mg): Organic Apple (fruit), Organic Amla Berry (fruit), Organic Beet (root), Organic Broccoli (stalk and flower), Organic Carrot (root), Organic Spinach (leaf), Organic Tomato (fruit), Organic Strawberry (fruit), Organic Tart Cherry (fruit), Organic Blackberry (fruit), Organic Green Bell Pepper (fruit), Organic Brussels Sprout (leaf), Organic Blueberry (fruit), Organic Ginger (root), Organic Garlic (bulb), Organic Green Onion (bulb), Organic Raspberry (fruit), Organic Parsley (leaf), Organic Cauliflower (flower and stem), Organic Red Cabbage (leaf), Organic Kale (leaf), Organic Cucumber (gourd), Organic Celery (stalk), Organic Asparagus (flower and stem). 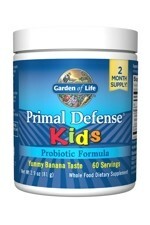 Probiotic Blend 1 Billion CFU: Lactobacillus bulgaricus, Lactobacillus plantarum, Saccharomyces cerevisiae. Other Ingredients: Organic Tapioca Dextrose, Organic Gum Arabic, Organic Sucanat Cane Sugar, Organic Erythritol, Natural Flavours, Organic Stevia (leaf), Citric Acid, Organic Coating (Organic Tapioca Maltodextrin, Organic Sunflower Lecithin, Organic Palm oil, Organic Guar Gum). 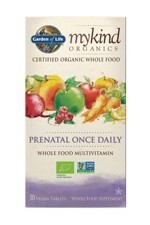 For a full list of ingredients and nutritional facts, please view the product label by clicking the blue "View Label" button at the top of this page.